In the mix: Who's pushing for selection for round five? Get them in: Midfielder Hugh Greenwood had a big game in the SANFL with 33 disposals, 10 clearances and two goals to show he's ready for his first AFL game of the season, while Bryce Gibbs was solid with 28 disposals. A stack of inside midfielders will deny Patrick Wilson a call-up despite 42 touches. Jordan Gallucci, Tyson Stengle, Elliott Himmelberg, Ned McHenry and Lachlan Sholl also have claims. Veteran Andy Otten, the travelling emergency last week, is another option. Under the pump: Kyle Hartigan, Josh Jenkins, Chayce Jones, Riley Knight and Lachlan Murphy. Medical room: Jones and McHenry will have to pass concussion tests this week. Get them in: Another thumping win in the NEAFL saw a number of players make strong cases. Midfielder Ben Keays, who has played as a small forward at the senior level, kicked six goals, while Ryan Lester was also strong at half-back. Under the pump: Plenty of players were down against Essendon, with Nick Robertson struggling in defence in his first game of the season. Medical room: No fresh injuries but Cam Rayner continues to look less than 100 per cent following a corked thigh from a couple of weeks ago. Get them in: Matthew Kreuzer made a successful return to action with 16 disposals and a goal in the VFL on Sunday. Jack Silvagni was also among the best, winning 19 touches and kicking two goals out of the midfield. 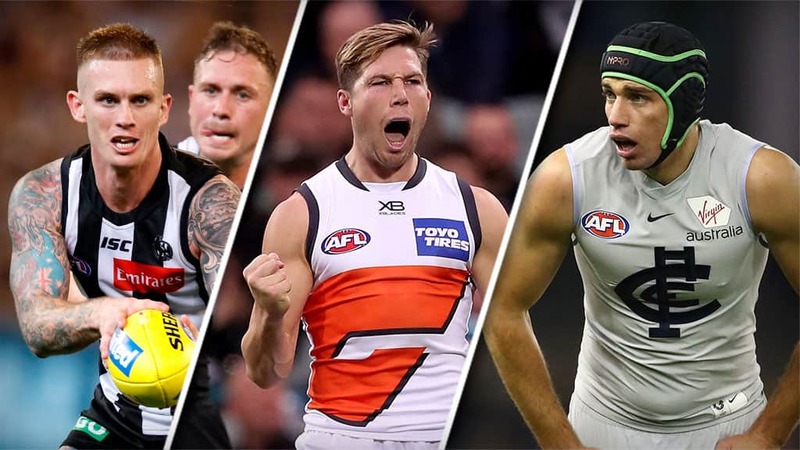 Under the pump: A couple of Carlton's big men might find themselves under a bit of pressure this week, with Levi Casboult and Matthew Lobbe both struggling against the Suns. The Blues played a tall lineup, so might drop a couple against the Dogs. Medical room: The Blues will keep tabs on David Cuningham's fitness as he returns from a bruised kidney. Both Tom Williamson and Harrison Macreadie should return to action this week, though they are likely to do so via the VFL. Matthew Kennedy suffered a corked quad and didn't play VFL last week, while Alex Fasolo endured back spasms. Get them in: Midfield star Dayne Beams is tipped to return from illness and Levi Greenwood could be recalled to tag Lions gun Lachie Neale. Other options include defenders Flynn Appleby and Isaac Quaynor. Under the pump: Callum Brown last week performed well as a late replacement for Beams, and the gutsy runner now needs to build on that effort. Medical room: Disciplined runner Chris Mayne sustained a fracture in his back and will be sidelined for at least a fortnight. Get them in: Joe Daniher is available for selection after that pre-season calf injury, but whether the Bombers play him in the VFL or AFL side is now the question. The Bombers dropped Aaron Francis last week but with the club's VFL side having the bye, he had no chance to impress. Kyle Langford and Matt Guelfi will also be considered. Under the pump: Mark Baguley hasn't picked up many touches this season – averaging fewer than nine disposals and 2.5 tackles – but he has kicked a goal in all four games in that pressure forward role. Medical room: Daniher is the big watch here and how the Bombers handle that. Martin Gleeson (ankle) is getting back to full fitness and will be a welcome addition to the half-back line when he's got enough VFL performances under his belt. David Zaharakis copped a knock to his knee against the Lions but was a key performer. Get them in: Stoppage beast Nat Fyfe still has to pass his cognitive state test to be cleared to resume 13 days after his concussion against St Kilda. He will be needed against Greater Western Sydney's gun onball brigade. Under the pump: Lachie Schultz and Sam Switkowski contributed after coming in for the Western Derby, but someone will have to miss out for Fyfe. Medical room: The Dockers will be sweating on Joel Hamling's availability after he was concussed in the derby ahead of a tough challenge against the Giants' in-form tall forwards. Get them in: Midfielder Cam Guthrie had a team-high 25 disposals in his first VFL game back from a calf injury. Brother Zach appears the next defender in line, while James Parsons (23 disposals) and Sam Simpson (19 disposals) were strong. Talls Wylie Buzza (10 marks) and Darcy Fort (two goals) are around the mark. Under the pump: Round-one debutants Tom Atkins (14 disposals last week) and Gryan Miers (12 disposals) would be among the first considered to make way from the midfield/forward mix. First-year defender Jordan Clark may need a rest in coming weeks, while Mark O'Connor is yet to lock away his spot. Medical room: Zach Tuohy will be banging down the door for a return from a knee injury, however it may need to be through the VFL on Saturday. With that game eight days before the AFL clash in round six, it may be more favourable than an Easter Monday return. Get them in: Despite a loss to Sydney in the NEAFL a couple of players impressed, most notably George Horlin-Smith (32 disposals) on return from a back injury and Callum Ah Chee (24 disposals). Will Brodie continued to find the ball with 30 touches. Under the pump: The Suns' tall forwards – versatile Chris Burgess and number two draft pick Jack Lukosius – really struggled against the Blues. Both would be desperate to play in their hometown of Adelaide on Sunday but would be nervous. Medical room: Wil Powell missed the second half of the win over Carlton with concussion and it's hard to see him being available by Sunday. Get them in: Star forward Toby Greene could be fit to face Fremantle in Canberra after missing the past three games with a calf injury, but he'll need to get through a full week of training. Draftee Jackson Hately was impressive again in the NEAFL, while key defender Aidan Corr got through a full game in his second match back from a groin issue. Under the pump: Co-captain Callan Ward (knee) will miss the rest of the season after going down against Geelong and after such an outstanding win, there's unlikely to be any other unforced changes. Medical room: Ward is set for a knee reconstruction likely next week in a massive blow for GWS. Get them in: Kaiden Brand, Tim O'Brien and Conor Glass appear the likeliest options to replace injured key defender James Frawley. Dylan Moore continues to press his claims as a small forward and has already had a taste of senior-level footy this year, while Harry Jones is around the mark as an onball option. Is Jackson Ross ready for an opportunity after eight goals in two weeks in the VFL? Under the pump: Conor Nash might fit this description if the Hawks are keen to look at Moore or Ross up forward. Dan Howe was a late inclusion, so he could also be in danger. Medical room: Star midfielder Jaeger O'Meara (hip), fresh from signing a new four-year deal, is the one to watch here. O'Meara was a late out last week, but is expected to be fit to face Geelong on Easter Monday. James Frawley (hamstring) will miss, but Ben Stratton (concussion) should benefit from the eight-day break. Get them in: Neville Jetta (knee) and Jordan Lewis (hamstring) are pushing to play against the Saints, with the Demons having to make a few selection decisions after the win over the Swans. Jeff Garlett was best afield in the VFL and will also come into the selection mix, while Jay Lockhart may also return from a back complaint. Under the pump: Always tough to change a winning line-up, but Charlie Spargo, Josh Wagner, Billy Stretch and Corey Wagner might be the unlucky ones. Medical room: Jetta was a late withdrawal from the game against the Swans, but the Demons expect him to be fit to play. A decision on Lewis will need to be made, with the Demons facing a four-day turnaround into the Anzac Eve game against Richmond. Oscar McDonald has cleared concussion protocols. Get them in: Bailey Scott was rested last week but picked up a NAB AFL Rising Star nomination in round one. Defender Sam Wright is another option after two VFL games following a quad injury. Dom Tyson put his hand up for an immediate senior recall with 22 disposals and eight tackles in the VFL, while Nick Larkey booted three goals for the second straight week. Under the pump: The Roos made multiple changes last week and others who were on this radar, such as Jy Simpkin and Luke McDonald, have improved in recent weeks. Medical room: Marley Williams (ankle) remains out for at least one more game, while fellow defenders Ben McKay (toe) and Tom Murphy (ankle) picked up fresh injuries in the VFL. There were fears McKay had broken his foot, but scans cleared him and he may not miss a match. Murphy's prognosis is unknown, but he will be out this weekend. Taylor Garner (groin/quad) played two quarters in the VFL and came through unscathed. Get them in: Defender Jarrod Lienert is back in form after a knee injury, with 33 disposals and nine marks in Port's 21-point SANFL win against North Adelaide. Tall forward Todd Marshall got back among the goals with 4.2, Sam Mayes pressed his claims with 28 touches on a wing while Jack Trengove continues to find plenty of the ball with 35 touches, but it's hard to find room for him in the Power midfield. Under the pump: Steven Motlop had just seven disposals in the Power's loss to Richmond. Zak Butters and Sam Powell-Pepper struggled, while Dougal Howard will face competition from Lienert. Medical room: Midfielder Karl Amon will have his knee injury assessed this week but is more likely to return through the SANFL. Get them in: Brownlow medallist Dustin Martin is now available after suspension, while experienced defender Bachar Houli looks likely to return from a three-week hamstring strain. Small forward Dan Butler had 17 disposals and kicked 1.2 in the VFL after being dropped. Under the pump: A well-rounded effort against Port Adelaide means some tough decisions will have to be made to make room for Martin and Houli. He didn't have a horror game by any stretch, but as the last player in, Connor Menadue may be the first out. Jack Graham was the quietest of the Tiger mids, but still had 14 touches. Medical room: After a horror run this year, the Tigers got through an AFL match unscathed. Flanker Oleg Markov tore his right meniscus in the VFL and will miss six to eight weeks. Jack Riewoldt is pushing to return from a wrist injury, but with a four-day break between rounds five and six, is unlikely to feature. Get them in: Captain Jarryn Geary needs to overcome his virus while the Saints are hoping four-time best and fairest Jack Steven is right to go. Nick Hind was prolific for Sandringham (41 disposals and one goal) and Brandon White isn't far away from selection. Billy Longer could be considered to partner Rowan Marshall for the ruck duel against Melbourne giant Max Gawn. Under the pump: Up forward, Dean Kent has been quiet. Matthew Parker had five disposals against Hawthorn but his pressure was noticeable. Ben Paton was reasonable as a very late inclusion. Medical room: Hard-nosed defender Daniel McKenzie needs to overcome his concussion. Get them in: Draftee James Rowbottom had another big game in the NEAFL with three goals and 28 possessions, with Ryan Clarke, Robbie Fox and Colin O'Riordan all good in the Swans' win over Gold Coast. Under the pump: Small forward Ben Ronke had another quiet night in last week's loss to Melbourne, while draftee Nick Blakey and first-gamer Justin McInerney struggled against the Dees. Medical room: Daniel Menzel (groin) could be ready to resume playing in the next fortnight if he gets some solid training in without any issues, while youngster Matt Ling (toe) made his return in the second half of the NEAFL last week. Get them in: Jake Waterman is banging on the door after kicking 10 goals in two WAFL games, while Matthew Allen is around the mark after picking up 25 touches in the win over Peel. Finding a spot for them is the tough part. Under the pump: He has performed solidly in his two games but Josh Rotham was out of the side before earning a late reprieve for the Western Derby when Lewis Jetta was withdrawn. Medical room: If Jetta is fit after hamstring tightness he will come straight back in. Get them in: Plenty of impressive performances in Footscray's 72-point VFL smashing of Collingwood prior to the AFL clash on Friday night. Jackson Trengove was the dominant big man on the ground (25 disposals, 26 hitouts, two goals), Lukas Webb led the possession count with 29 and Lin Jong made a promising return from injury. Under the pump: Tim English conceded the worst hitout ratio in the AFL era to Collingwood star ruckman Brodie Grundy. Coach Luke Beveridge continues to back his developing tall despite Trengove's strong case. Billy Gowers only managed five touches in the loss to Collingwood. Medical room: Recently re-signed forward Fergus Greene injured his ankle in the VFL after being caught in a tackle and is likely to miss several weeks, while Tom Boyd made a successful return from a lingering back complaint in the same game. Verdict: The balance of the Dogs' side has been consistent across the opening month of the season. Trengove as an inclusion would likely be in support of English, rather than replacing him, so the question is whether Beveridge is willing to tinker with that. He might not feel obliged against Carlton's ruck stocks.